For those who understand that success is the result of teamwork, there is this powerful example offered by Robert and Karen McCaffrey. Robert A. McCaffrey, CEO of McCaffrey Homes, and wife Karen Bonadelle McCaffrey, the firm’s vice president, have partnered to create exciting home lifestyle opportunities for families throughout the Central San Joaquin Valley. Having constructed more than 8,000 homes in the region, McCaffrey Homes specializes in much more than just land development, residential construction, mortgage brokerage and farming – they work to build communities. McCaffrey Homes has been honored with many of the building industry’s and community’s highest awards. The company was recognized by Builder Magazine as the nation's 113th largest homebuilder in 2009, and the magazine has ranked McCaffrey Homes among the 150 builders nationwide on two other occasions since that time. The company was recognized as one of America’s most preferred homebuilders by Eliant, a national home industry consumer research company. In addition, McCaffrey Homes has been honored with numerous awards for architectural excellence, including The National Gold awards by the National Association of Home Builders and Gold Nugget awards at the Pacific Coast Builders Conference, which include the 2013 Grand Award. 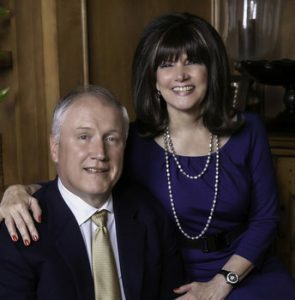 The McCaffreys were coached in the business by Karen’s father, John Bonadelle, a highly-respected, longtime Fresno real estate developer and homebuilder. It was from John that Robert and Karen learned the notion that houses were more than just homes and that creating quality life experiences for residents was the ultimate goal. Prior to becoming a homebuilder, Robert McCaffrey enjoyed a notable football career both at USC and professionally for the Green Bay Packers. Robert was the starting center for USC in 1973 and 1974 and helped muscle the Trojans to two national championships and three consecutive Rose Bowl appearances. His senior team’s record was an impressive 33 wins, three losses and two ties. He went on to earn a Bachelor of Science degree in Business Administration. A community and industry leader, Robert McCaffrey has served on the boards of philanthropic organizations including the St. Agnes Medical Center Men’s Club, B’Nai B’Rith Scholarship, and the Building Industry Association of Fresno/Madera, where he served as chairman of the board in 2004 and 2005. He currently serves on the board of directors of the California Building Industry Association (CBIA). Karen McCaffrey graduated from USC with a Bachelor of Science degree from the School of Public Administration. She has embraced a leadership role in her community, having served on the boards of such organizations as Children’s Hospital of Central California and USC’s Andrus School of Gerontology. She currently serves on the Advisory Board of the Gazarian Center of Real Estate at California State University, Fresno. In 2009, Karen was recognized as one of the Top Ten Professional Women of the Year of Fresno County. McCaffrey Homes actively supports collegiate activities, including sports tournaments at Cal State University of Fresno and they recently endowed a scholarship fund at Fresno State, creating educational opportunities for future city planners. Their ongoing philanthropic outreach supports the local community including Children’s Hospital Central California, HomeAid and Habitat for Humanity. ​Robert and Karen are joined in business by their daughter Lauren McCaffrey Knowlton and her husband, Ash, along with their son Brent McCaffrey and his wife Elizabeth. Incidentally, Robert and Brent are the first father and son in USC’s football history to be awarded “Most Valuable Offensive Lineman of the Year.” Bob earned the award in 1974 and Brent received the award in 2000, playing left tackle. The couple are proud grandparents to Braden, McKenna and Bryce – all future fourth generation homebuilders – a fourth grandchild due in the fall.